It is an over-used cliché, but this really was a game of two halves. Several Leicester fans were badly delayed by an accident on the M1 and many (including my sister and friends) only got to the ground in time for the second half. Had they known, they may not have been upset at missing the horror show that was the first half and which went from bad to worse. The line-up seemed rather strange, although no-one could object to the inclusion of Iborra; Ndidi has not been his usually dominant self for a few matches now. Okazaki up front was bizarre and although he worked as hard as ever, made little impact despite a rather soft penalty claim in the third minute. Sadly, Iborra’s cameo led ultimately to the Brighton goal as he lost the ball in the final third, not for the first time. This came in the 11th minute and Brighton were ahead three minutes later when Murray (who else?) seemed to have acres of space to score with a header. Maddison (who also has not been at his best in recent games) gave away a silly foul in the 25th minute, clipping the heels of one-time City favourite Knockaert in an area where he could not have much of an impact on the game. Maddison did not learn from others’ mistakes when on a yellow card, and went down in the box in the 28th minute when there was minimal contact. As it was at the far end from the City supporters, it was not clear if it was a dive or not but the man who mattered – the referee – clearly thought it was and the inevitable second yellow meant that Leicester had to play the rest of the game with ten players. Fortunately, Brighton did not press home their advantage and were made to pay for it. Maddison later admitted that he had dived and that he would learn from his mistake. Iborra was injured in the 32nd minute and was replaced by Ndidi, who seemed back to his best – perhaps being dropped was the spur he needed! 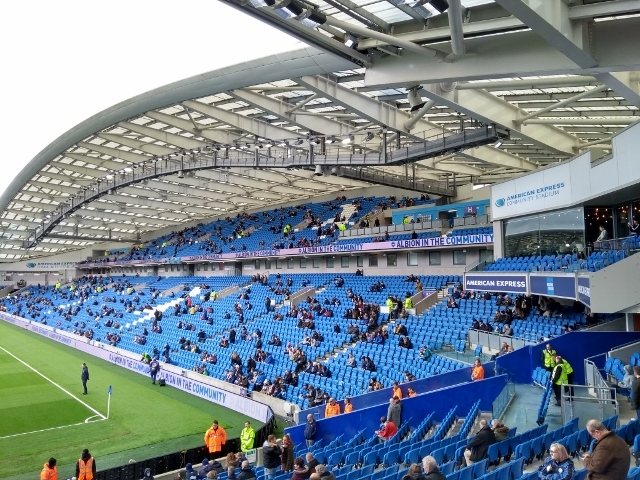 For the rest of the first half it was damage limitation and the section of City fans calling for Puel’s sacking were in full voice. For once, Puel’s second and third substitutions were inspired – Vardy in the 55th minute and Iheanacho in the 70th. Vardy was putting himself about in a way we haven’t seen for a while and clearly unsettled the Brighton players and their fans, who anticipated what was to come. In the 79th minute Iheanacho was tripped in the penalty area and Vardy despatched the penalty with power and accuracy (Mahrez take note!). After this, there were few chances for either side although Iheanacho could have scored at the death with a shot that only just went wide. It is difficult to know what the future holds. Being charitable, perhaps the players are still adapting to the chairman’s death and their heads are still not right, but they cannot go on with starting so sluggishly and playing catch-up. They are still in tenth place in the table, but a few more displays like the first half and we will be worrying about relegation again.